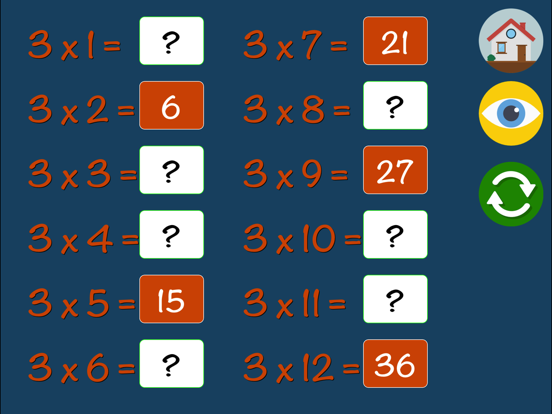 Little Monkey Apps Times tables provides the repetition required for the mastery of times tables with innovative presentation and delivery. No more 20 out of 20! 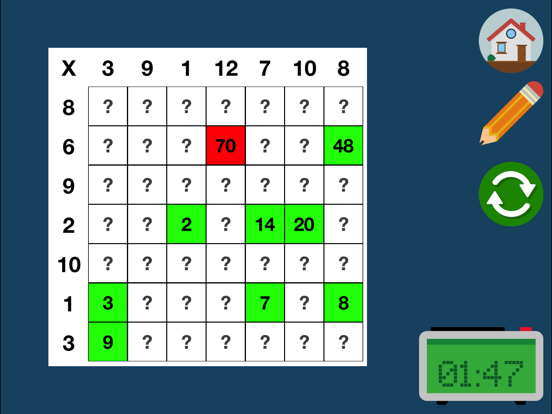 Little Monkey App Times tables presents students with a random grid of 81 spaces asking multiplication questions from numbers 1 through 12. Unlike flash card methods, individual tables or multiple choices, students must use their knowledge to commit to a specific answer. 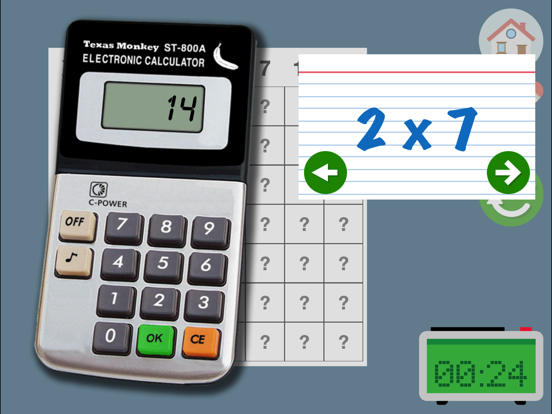 Students complete each answer using the monkey calculator, promoting calculator skills as a bonus. Little Monkey Apps Times tables endeavours to provide support to students' individual capabilities. The pencil corrector enables them to 'peek' at the answers if they wish to measure their progress throughout the game. Beginning students will find this useful to check if they are on the right track. This feature also encourages self-correction and checking of answers. More confident students are able wait until they finish all 81 tiles. Little Monkey Apps Times tables measures progress through the achievement of speed and more importantly, accuracy. Students and parents can track progress through accuracy percentage and improvements to time, meaning improvements can be monitored on an individual basis rather than comparison to others. Little Monkey Apps Times tables challenges students to remain engaged to beat their own personal record through the acquisition of badges. Specific badges are awarded for targeted milestones such as speed, accuracy and 'not peeking'. Every student will want to continue to play to beat their own personal record and achieve these badges. 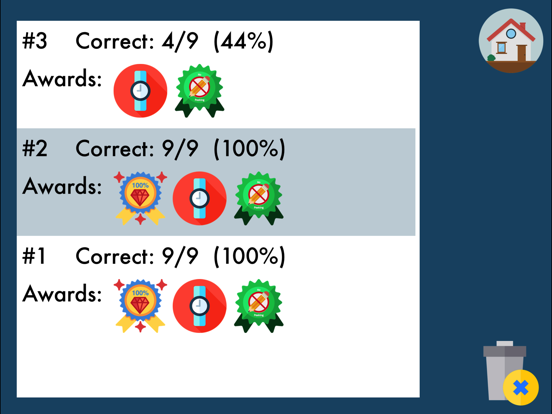 Little Monkey Apps Times tables is an interesting, alternative delivery of mastering times tables content. You can now also play smaller grid games! 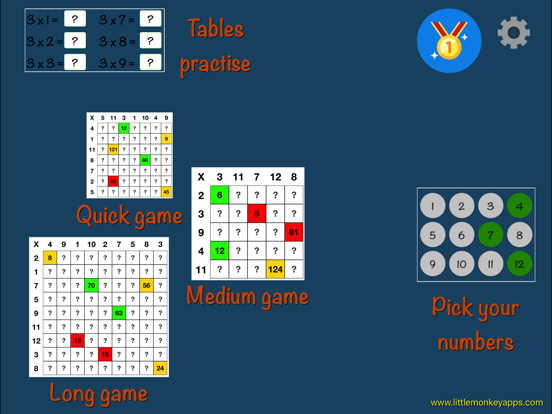 A new practise game has also been added. This allows students to practise on a table at a time. Students simply tap the '?' beside the question to see the answer. Note the practise activity does not record badges. Times tables can be fun!